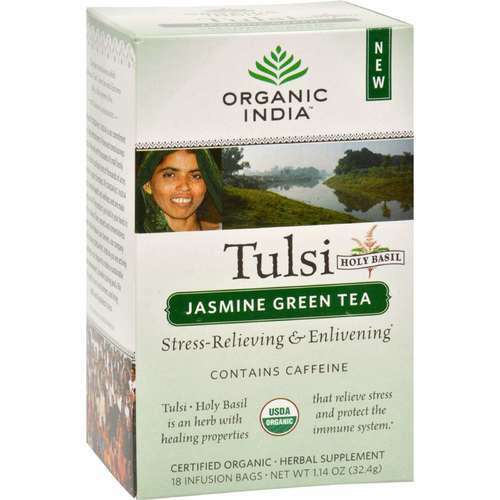 Organic India Tulsi Tea is a plant based tea option that is both caffeine and gluten free. 警告: Store in cool, dry place. Keep out of reach of children. 注意事项: Caffeine Free. Gluten Free. USDA Organic. 推荐用法: Pour 8 oz. of freshly boiled water over infusion bag in a cup ans steep 5-10 minutes. Add a natural sweetener and milk, or dairy substitute if desired. Double the strength when serving iced. 1 Quart of Iced Tea: Pour 2 cups of boiling water over 8 infusion bags and steep for 20 minutes. Remove bags, and 2 cups of cold water, and a sweetener if desired. Refrigerate and serve over ice.